The first incident involves Syriza. Syriza proves, every day and moment, that it is the boss and master of the old, fatigued, dead Right of the PM Antonis Samaras. In yet another attempt to target the Movement, the Minister of Civilian Protection, always under the guidance of Syriza, sent a D.A. and policemen on the central offices of the Regional Organization of the Southern Suburbs on the area of Alimos, the day after the question of a Syriza MP regarding the presence of cameras in the offices, during a session on the Parliament. 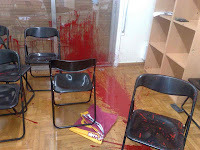 Those were the same offices that were vandalized during the cowardly attack of anarchists on October 6, 2012. 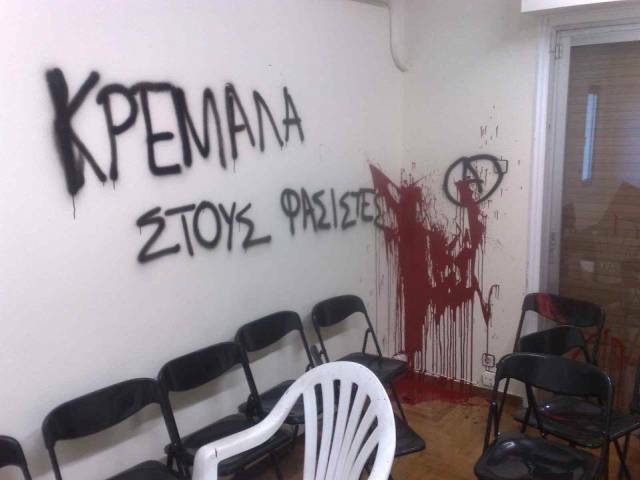 And even though known parastate anarchist circles, directly linked to Syriza, claimed the responsibility of the attack, no charge whatsoever was pressed. Ever since the attack, the offices are guarded by four security cameras, two on the interior of the offices, and two pointing on the entrance, to identify the visitors for security reasons. A sign on the exterior informs every visitor that the offices are under surveillance. The State's lighting-fast reaction after the leftist MP's provocative request raises many questions. Why did the Police react so fast for something as trivial as security cameras, but still nothing is done about this, and more than 30 other attacks we have faced over those many years of our activity?? Attacks that become more reckless every day that passes. So the State, the so-called party of the "patriotic Right", instead of prosecuting the arsonists and vandals, sends D.As to check where our cameras are pointing. 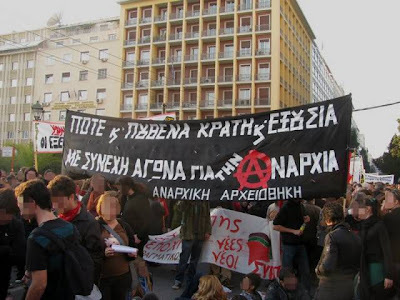 Syriza and the anarchists are known to be cooperating. 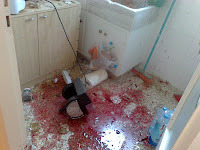 The second incident involves the KKE, and was more extreme. The same day, policemen illegally invaded the offices of the R.O. 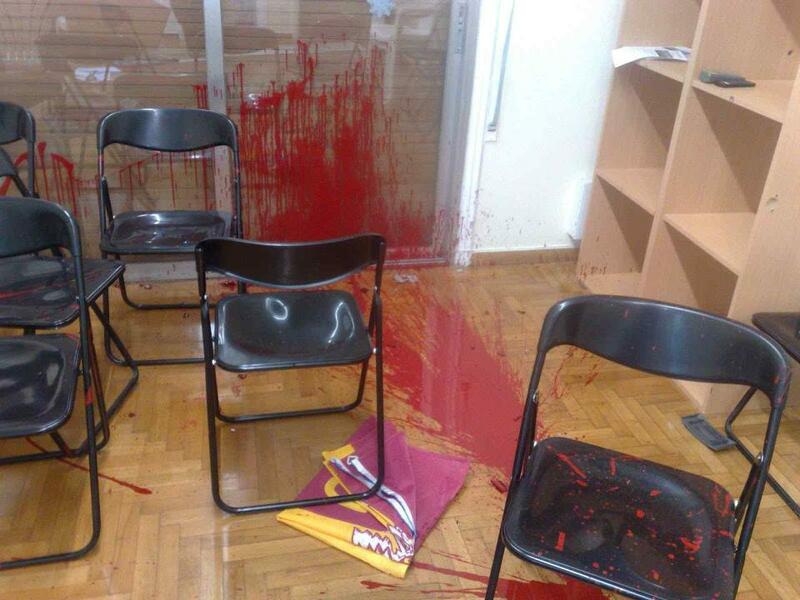 in Anavysos, and illegally arrested a member, after the false accusation of a KKE member. The policemen surrounded the offices and interrupted an event held there. They proceeded to arrest a member attending, all without the presence of a D.A., thus illegally. The "reason" behind this attack was the accusations of the KKE that Golden Dawners brutally assaulted one of its members for, and I quote, "hearing revolutionary songs". He stated that the comrades hit him on the head - something contradicting the truth, as we can clearly see bellow: No sign of trauma. The imaginary people assaulting him retreated to the offices after they saw a police car moving towards them. The other members on the offices followed the arrested comrade to the local Police Station. 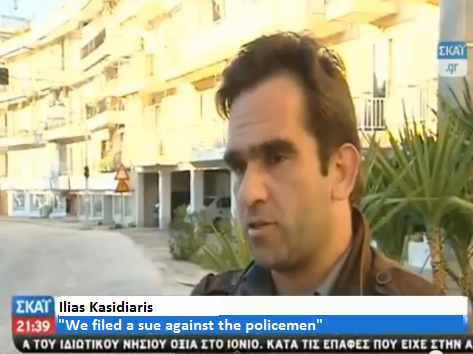 Ilias Kasidiaris arrived shortly after, and sued the policemen participating in this charade for the interruption of a political conference and violation of duty. Later that same night, the comrade was released, because the communist didn't identify ANY member of the R.O. as the perpetrator of this imaginary assault. The Minister of Civilian Protection, a man that stated he is a friend of the Masons with his own words and has connections with the Jewish bankers of the Rothschild family, the Minister that created the Anti-Racist Police Division, congratulated the captain and the police officers for their actions that night. Actions that included, as our Press Representative Ilias Kasidiaris stated, the harrasment of children and families that attended the event. On the video-document of that night, MP George Germenis protests against the violent rage of the officers of the Riot Control Unit. He asks them to leave and not return unless they have a D.A. and evidence with them. Press Representative Ilias Kasidiaris: Yesterday, within one day, we had two illegal invasions on our offices in Alimos and Anavysos. In Anavysos, the RCU officers harassed children and families that attended the event, without something to justify those actions, a sue or a criminal act. This happened because the Police, which we sued, follows orders from Syriza, from the KKE, and professional syndicalists. This is the fake Right-wing state that has destroyed the Greek People, this is the fake Left that has ridiculed every general strike - the last general strike didn't even mobilized half the workers our demonstration on February 2 did, because no Greek wants to see Tsipra's fake smiles while the Greek People starves. The reason our Movement is targeted and attacked by the State and its instruments, namely the anarchists and the communists that trap the Greek workers, is none other our struggle to cleanse this land from local and foreign usurers, that employ and feed our rulers. They will do anything, for a reason to ban us. Because we are a real threat to their System, we face attacks from everyone, and even those that call themselves revolutionaries, cry on the State's shoulder just to scare us and weaken us. 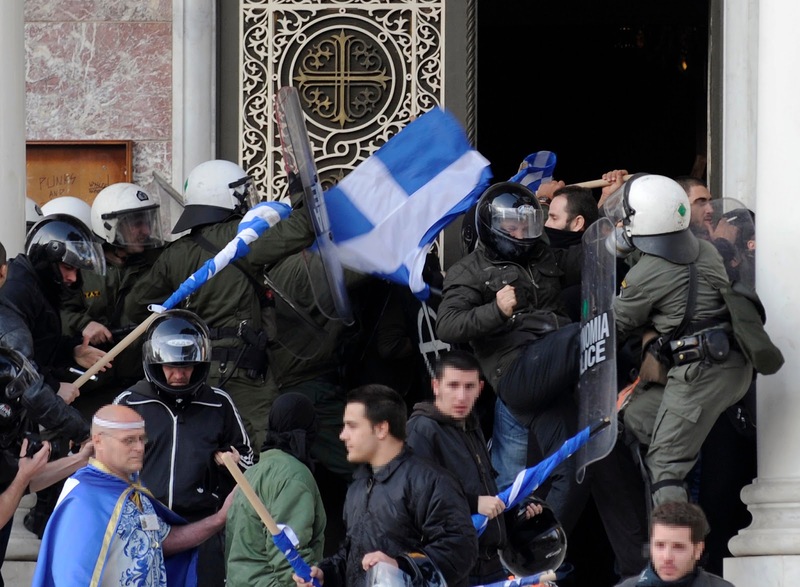 I hope self-defense is well tolerated in Greece. Any bad guy to enter the offices should be confronted. My suggestion is to have k9 units or guard dogs at the property around or inside the offices. If this is legal of course. In America dogs slaughter bugulars and vandilars. As long if they were an intruder this is an easy case in court. I once saw a short video somewhere of Michaloliakos responding on the visit to Greece of some guy by the name of 'Mujziek' or something like that. I can't find it anymore however, does anyone here know if it's still available somewhere? Whatever you do, do not attack their offices. 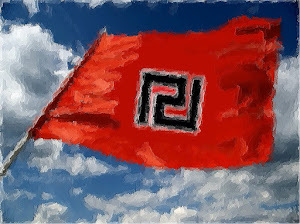 In an organization where hatred towards it is so common (referring to the Golden Dawn) there is no accurate prediction to be made of the accusations to be announced against the Golden Dawn. Never leave yourselves open to propagation made by your political opponents only to harm your party's reputation. To prevent a further rise in popularity, while interrupting the currently skyrocketing surge in support, they may try to poison the minds of your followers so that they can achieve the same goal of owning Greece while at the same time lacking any political solution suitable for the economic system in Greece. Workers must get what they deserve. The only ones wiling to establish that fact as a rightfully enforced law for economic sake would be the Golden Dawn. Victimization of innocent nationalist politicians is now in Golden Dawns favor, against an opposing party running for political superiority that presents social slavery in the governments favor. 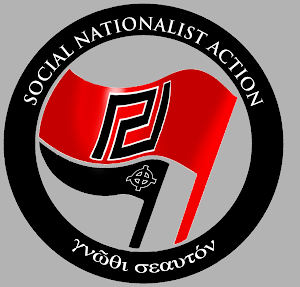 The Golden Dawn program is with few risk while the KKE communist party gaining support in Greece is just a sign of unity disaster and the confirmation of a possible civil war. A politician under threat and victimized is a politician with much potential. 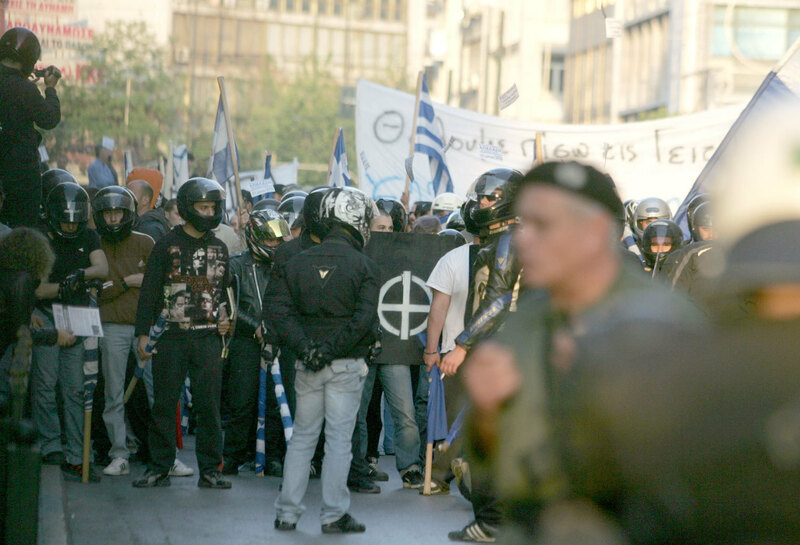 Let the Greeks understand the hostilities and unlawful actions against the peace-keeping Golden Dawn. Look at them trying to taunt Golden Dawn...what they must realize is they can kill people, but they will never kill an ideology, that's where Golden Dawn has an advantage. These left wing loony's, communists and anarchists have no ideology except monetary gains, and when there's no money to go around that will be their down fall. What's GD's relationship with The Nortwest front like? One question to this blog: there exists some rumors that Blackwater has been hired by greek authorities because of fear of coups. What are the real situation here. The Blackwater rumor is very interesting. 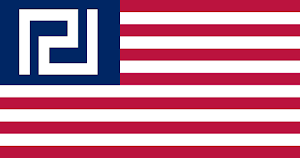 There are groups of trained Nationalists in the US (ex-military, ex-police) that can be sent to Greece in aid of GD. Their will come a time when assassinations will be necessary of those that perpetrate these acts, not at this time, but in time, until then Gard what is yours and stand your ground. The people of Greece are counting on you for liberation in so many ways. I Think the only hope is all the Nationalist movements in Europe unite themselves. And they should know that they cant go to power througt elections. Because the mainstream media will always fight GD or other with lies and put all evil lebels on them. Milions of people are not awake and will follow this lies. The right strategy for GD and others is trying to get the military on their side. And them overthrow the ultra-corrupt and anti-patriotic governments. I was reading on /new/ that Blackwater greed-influenced mercenaries are overseeing the Greek police. If this is true, they must be exposed, if not dragged through the streets as enemies of Greece. We have lists of Blackwater execs and their family members (including contact details) that will be published and pursued should Blackwater operatives target Golden Dawn members. Fear not GD those police officers are Greeks and many of them must be sickened by having to do the dirty work of the treacherous government. The police have their breaking point just like anyone else, one day they will ordered to act against you and they will refuse to obey those orders. On that day the tide will have truly turned.